We do not want anyone to feel disappointed if they could not tune into the WADK radio broadcast last week, so we got our hands on a copy of the show for your listening pleasure. Also, be sure to pick up the Wednesday, June 26 Providence Journal. (Yes, tomorrow!) Flip to the food section and read editor Gail Ciampa's interview with us about Rhode Island Recipes, with photos by the wonderful Sandor Bodo (and recipes from the book). And to top it all off, we will be sharing our 'Love Letter to Rhode Island food' aka Rhode Island Recipes on The Rhode Show between 9-10 am tomorrow as well. Hopefully, you were able to tune in this past Monday as we chatted live with Bruce Newbury on WADK 1540 AM Newport. If not, do not despair, as you can hear the broadcast again this Sunday, June 23rd between 11 AM and 12 Noon on AM 790 in Providence. Bruce Newbury was an entertaining host and has as much passion as we do for Rhode Island, the food products we love and our Rhode Island Recipes cookbook. Continue checking in as there are some exciting announcements coming next week! p.s. Doesn't Lydia look like a natural? This past weekend, I attended the Festival Fete at Garden City Center in Cranston, Rhode Island. While I was there, I made sure to stop by the Gerbs Seeds booth to chat and see if they had added to their product line. I am happy to say 'yes, they did!'. They now have Granolas and Salad Fixins! They are also now separating their product line into four different categories: Seeds, Granola, Salad Toppings, and Snack Mixes. If you want to see how we used Gerbs Pumpkin Seeds in our recipes, pick up your copy of our cookbook today (ebook or print). Use the links at left to order. If you're not the splattering kind of cook, the Rhode Island Recipes e-book is for you. Click this link to order. 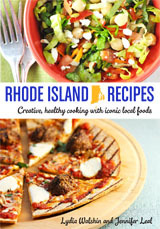 If you don't have a Kindle, you can download the free Kindle app and read Rhode Island Recipes on any device: smart phone, tablet, laptop or desktop.